Argan Oil | What is it? Originally from Morocco, the argan tree is known as “the tree blessed by Gods”, according to the Berber women. Indeed, the argan tree is an ancient tree that grows on the sunny side of Mount Atlas. The plantation area that guards these ancient trees was classified in 1999 as a World Heritage Site (UNESCO) for it’s environmental value. Argan trees are used by the local populations for multiple reasons (culinary, cosmetics..). The fruit produced from an argan tree is about the same size (perhaps a little bigger) than that of an olive. It becomes ripe at the end of each spring season before falling off the tree at the end of summer. The fleshy fruit contains a hard outer shell, inside which are argan-rich kernels. These argan-rich kernels need to be cold pressed in order to obtain argan oil in it’s purest form. Argan oil appears transparent and yellowish, with a particular yet subtle odor. The locals use argan food oil for small culinary plates such as for dipping bread, couscous, etc. It is believed that consuming argan oil on a regular basis has several health benefits. Reducing cholesterol or preventing obesity and cardiovascular diseases, are but some examples. Argan oil is not only used for culinary purposes, however. Indeed, due to its extraordinary benefits for skin and hair care, argan oil is heavily used in cosmetics! Like for the other oils that I mention on this blog, it is very important that argan oil is virgin cold-pressed. This assures that the extraction process avoids treatment with heat or solvants, which would result in it losing all its natural and beneficial properties. For best health and beauty results, always choose the highest quality castor oil and argan oil. Hair efficiency 90/100 90/100 Both oils are extremely effective! General efficiency 85/100 95/100 Our castor oil remains unbeatable! Castor oil and argan oil indeed have their individual benefits. However, when we put the two together, we can create an additional masterpiece of natural health and beauty remedies. For an extra boost, you can also incorporate essential oils to the mix for even more benefits. Below are some ideas for using castor oil with argan oil and other complementary oils! Apply this mask before bed at night and wash off in the morning. Shampoo at least twice and rinse well. 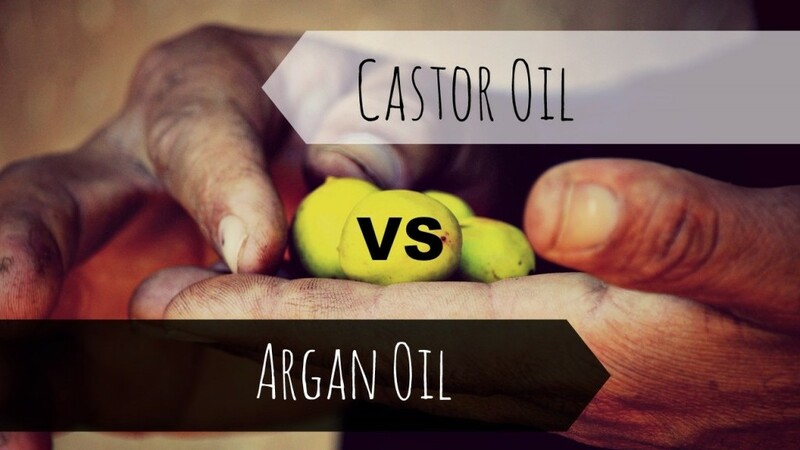 What do you think of this castor oil and argan oil comparison? Do let me know your thoughts in the comment section below! And always, don’t hesitate to send any questions my way. Hope you enjoyed reading about these two wonderful oils! Follow me to get the latest articles on Castor Oil Guide! I came across your blog about castor oil vs argan oil, as i am moroccan citizen there’s a very big quality in argan oil, because its very bio, you can find argan tree in naturely growth in rock and it don’t need water or some care. And its benefit for hair is extremely good. Hi🙂 i was wondering which oil helps the most fighting acne, breakouts and trouble skin? I would like to ask what your thoughts are on mixing castor oil with rosemary EO, argan oil and cedar wood EO. I have heard both castor and cedar wood oils are good to fight hair loss and strengthen our locks but I could not find anything related to these two in one mix. Can i mix castor oil,argan oil and coconut oil? Can i mix castor oil, argan oil and jojoba oil? Hallo, i have started using argan oik with caster oil and coconut oil. I just want to know, why should you wash you hair after using these product. Can’t you just leave it on for a two or three days? Hi Katrina! Thanks for reaching out. I recommend washing right after because as you’ll see with application, the oily mixture really makes your hair feel-and appear-greasy (while it’s on). Also, you wouldn’t want to sleep 2-3 nights in a row with your hair soaked in castor oil because it would rub off on anything you touch! It’s better to do smaller applications (one overnight or for 2-3 hours during the day) a couple times a week than it is to just leave it on. I hope you like using argan, castor and coconut oil – those three are my favorites! Thanks for dropping by and see you again soon on COG. I mixed both castor oil and olive oil and the results are very positive,after a month my hair was longer tham it was,thanks,how frequent should one use the castor oil?is it daily ? Hi Rahma! That’s wonderful to hear! You can use castor oil very often, I prefer to use it 3x a week on my hair (usually overnight) because doing it everyday takes a lot of work and I want to avoid overwashing my hair. You can use castor oil daily for your face, skin, nails. How many times per week were you applying? That’s great results! Thanks for sharing with me 🙂 Always happy to hear castor oil is benefiting other people too! How long have you been using castor and olive oil? Can you use castor oil for mole removal? if yes, then how? Hi Alex, castor oil isn’t really effective for mole removal, though it can help soften the color of moles or dark skin marks. I’ve read before that you can use baking soda to try and “dry” the mole, and then use castor oil after to help heal and moisturize. But I’m not certain on the effectiveness of this method. There are other natural methods though with a quick Google search I’m sure you could find something, maybe apple cider vinegar? Let me know what you find if you can, I’d be interested in writing an article about it! Thanks for dropping by! i mixed castor oil & argan oil both were clear transparent oils but after mixing the combination has become milky is it safe to use? Hey, I was wondering if I could use coconut oil, argan oil and castor oil all together and if so in what quantities should I use each of them? Hi there! Thanks for stopping by! It depends what you want to do with it but I would say you can mix 1/3 of each. I am an African who have natural curly hair. I use jamacain castor oil mix with olive oil. Can you mix olive oil with argon oil? Hi Brenda! Thanks for dropping by! Jamaican castor oil is a great choice indeed! As for olive oil and argan oil, they can me mixed at your convenience. It’s all about trying to find the right balance for your hair! Olive and argan oil are both wonderful for hair health. I wrote articles for both oils, you can find them here.